The Pillars of Reality, by author Jack Campbell, is a series that continues to engage and entertain me. Book 3, the Assassins of Altis sees our heroes, a Mage named Alain, and a Mechanic named Mari, continue their quest to root out what has so clearly gone wrong with the world they live in. The two have become unlikely lovers, and this entree sees the two take that dynamic to the next likely step. I cannot stress enough how oddly refreshing it is for a non-YA fantasy book to actually follow two characters in love, without splitting them up at some stage. The two are integral to each other’s survival. And this book really puts the strength and malice of the Mechanics Guild against them. We see a lot more of their ingenuity as a duo in this read than we have in previous novels. But not only are they a good match for each other in the sense that they can play off each other’s unique abilities. They bring out the best in each other, helping them find truth where the Great Guilds have hid it from them and the world. We see our heroes confront what they so eagerly need them to, to help them push onward. Most particularly, in this case, Mari – and what has held her emotionally back since she joined the Guild. I’ve made mention in previous reviews of this series that I almost didn’t expect certain issues I had with it to be resolved in subsequent novels. Well now I fear the exact opposite. We actually learn so much in a quick (but begrudgingly necessary) infodump near the end of the novel about the origins of the world and Guilds, that I worry there won’t be any major revelations at the actual close of the series. But that remains to be seen. 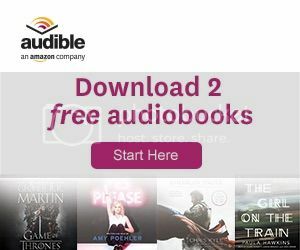 It is planned as a six book series, each book debuting first on Audible’s audiobook streaming service. 4 novels have been released to date. If you haven’t checked the series out yet, I highly recommend it. It bends genre in unique ways, without ever really trying to. It’s delightful, exciting, and full of adventure – something missing from much of today’s fantasy fiction. I’m starting to really get annoyed at the titling for each book though. Only a small portion of each novel (generally the last 10%) actually has anything to do with it. Kinda jarring for me, for whatever reason. Minor gripe.